A person with a strong will can do so much when crisis and moments of confusion hit them unaware because this brings a clear vision of their goal. Sharon Lechter, business owner, entrepreneur and the driving force behind the books and brand of Rich Dad Poor Dad encourages people to develop a strong will and take control of their lives. She has made many pivots in her life, starting from her professional career in a large accounting firm where a client invited her to start a business but ended up as bad decision. 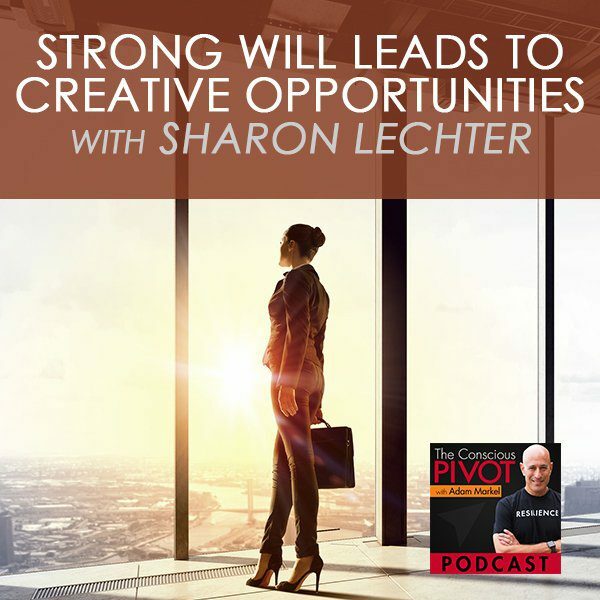 Like many other pivots from many other individuals, this one came along with creative opportunities for Sharon that also led to meeting her husband Michael. Sharon shares her experiences of losing her youngest son and moving past that to a positive future. We’re going to have the amazing Sharon Lechter. Sharon Lechter was the real inspiration and the force behind the Rich Dad Poor Dad book and brand for many years, fourteen books. She is an icon in this personal development space and in the financial literacy space. She’s taught and trained so many people around the world. She’s now with the Napoleon Hill Foundation and has been for many years. Think and Grow Rich for Women is one of her books, as well as Outwitting the Devil. We’re going to have some incredible conversations about practices, around rituals and around pivots. She’s going to share a very profound pivot story with us. In so many ways, we are all pivoting. Like everything in nature, there’s change everywhere. Things are changing all the time. The seasons are changing and the weather is changing. There are clouds and then there’s sun and there’s light and dark all this change that’s in nature, and yet oftentimes we resist change. That change scares the daylights out of us. In some cases, change is scary. I don’t want to ever pretend that it’s not what it is, but recognizing what it is. There’s that expression people say, “It is what it is,” it’s like fingernails on a chalkboard when I hear that thing because it’s not what it is, it’s what we make it. It’s not what it is, it’s what we utilize it to be. When we talk about change, we’re talking about the utilization of change, not just management of change. That, to me, is the true alchemy and the opportunity for our lives to be what they can be and what may well have been designed to be if we don’t get in the way of it as something so divine there. I want to start with gratitude to say a blessing for all of us that we’re here, that we’re together. This is a sacred moment. We are awake. As we get to take and receive a breath together collectively, it’s a fact that all over the world there are people taking their very last breath in this moment. Regardless of what pains you might have or challenges or the joy that you might be experiencing, this moment is sacred and it’s special. It’s holy. I feel blessed to be here with all of you and to be here with this incredible guest. That we get to share this time together, be awake and be even more awake as a result of this conversation, is something I’m very grateful for. I truly love my life and I hope you absolutely love your life. You’re going to love your life so much more because I have the amazing Sharon Lechter with me. Sharon Lechter is an internationally recognized business owner and entrepreneur. She is recognized as a financial literacy expert and a keynote speaker. She is also a New York Times bestselling author, a successful entrepreneur, philanthropist, licensed CPA and a Chartered Global Management Accountant. She’s the founder and CEO of Pay Your Family First, a financial education organization that provides tools to support families, women and entrepreneurs. Sharon has a passion for financial literacy and entrepreneurship, inspiring individuals and businesses for more than 30 years. She’s credited as the genius behind the Rich Dad brand. Sharon is currently partnered with the Napoleon Hill Foundation. As a driving force behind these two mega brands, Sharon has demonstrated her entrepreneurial vision and expertise empowering audiences with messages of hope and prosperity. Sharon is the author of the best-selling books Think and Grow Rich for Women as well as Outwitting the Devil, Three Feet from Gold and the fourteen Rich Dad Poor Dad books. Without further ado, it is my honor and my pleasure to welcome you, Sharon. Thanks for being on the show. Thank you so much. I’m happy to be with you, Adam. You’ve got a beautiful CV, as we used to call it when I was a lawyer, a Curriculum Vitae or resume. You’ve done so many things. You’ve helped so many people. Your work between the books, the education programs, the lectures you’ve given, the talks all over the world, you’ve probably touched the lives of millions and millions of people at this point. That’s pretty incredible. I know you’re a devoted mother and grandmother and you’ve got a lot of things going on in your life. Where are you today in terms of your passion? What are you jazzed up about in your business? After you’ve helped millions and millions of people, where do you go from there? I know you are so active. Share with us what you’re passionate about today. My passion is, for many years, writing the books and doing the seminars and one too many. Today, I’m doing a lot of one-on-one training which really is wonderful. Every time I hear from someone who is able to make an improvement in their life, it feeds me and gives me the excitement, the courage, and the ability to continue wanting to continue down that path. My resume is very long but it’s something that no matter what I’ve done, whether I was on the President’s Advisory Council or expanding the Rich Dad Organization or now helping re-ignite Napoleon Hill’s legacy and his teachings, I get as much as I give from the people that are eager to take a step and improve their lives. That’s what feeds me, the fact that there are people out there that don’t want to be victims. They want to be victors. They want to take control of their lives. That’s the thing that feeds my passion. Sometimes I go, “Maybe it’s time to let life be a little slower and slow down.” I am terrible at slowing down, so it doesn’t work for me. At the beginning of 2016, I was on the road about 70% of the time. My goal for 2017 was to cut that back to 50. On 2017, I was on the road about 80% of the time. I failed miserably at slowing down and said, “Maybe slowing down isn’t the right answer for me.” I continue doing what I’m doing and that’s what feeds me. I need to keep doing it. I get as much as I give from the people that are eager to take a step and improve their lives. We have to feed our souls either by design so we choose to feed our souls in some way that’s conscious, or we feed our souls by default. When I was spending my eighteen years as a lawyer before this, personal growth and human potential, that area was the major pivot in my career. I’d never done any of that work before. What was going on before that was allowing my soul to be fed without any consciousness about it and, therefore, my soul felt like it was shriveling. It was like dying on the inside. When I read Outwitting the Devil, and I would love for you to shed a little bit of light on this, I realized that for many years I was drifting. Even though I was quite driven by my occupation and to earn money and make money and pay the bills and all the usual things that we get driven by sometimes, I was drifting on the inside. Waking up in the morning and feeling at the beginning of the day no enthusiasm, not any excitement for what was to come, was like being lost at sea. In the book, one of the big takeaways, one of the things that changed my perspective and a lot of other people’s was this concept of drifting. Would you share a little bit about that concept? Have you drifted in your life? Where did you pinpoint that you were aware that maybe drifting was a challenge for you and what did you do about it? When you start thinking about the fear when we were kids, our parents talking about money, saying we can’t afford it, it doesn’t grow on trees, all of those things that we heard as young people about money were negative. We’d have money negative, money negative, money negative, and all of a sudden, it builds a subconscious fear about money. We’re afraid we’re not going to ever have enough, and then when we make it, we’re afraid we’re going to lose it. We don’t know where that fear is coming from. Outwitting the Devil allows us to open our subconscious and realize the things that have happened to us all during our lives that have caused this deep-seated fear and angst about certain things in our life that we didn’t even consciously recognize was there. Once you reveal it and you think about it, it’s like you start feeling these things click like, “I can let go of that and start making productive use of my life.” Outwitting the Devil was transformational for me as well. Our goal, when I started working with Napoleon Hill Foundation, was to bring his teachings to the younger generation. Three Feet from Gold did a great job but Outwitting the Devil truly hit the mark. The book is a little in-your-face but it helps open your eyes to those things. Hill says 98% of the world are drifters. The issue is, are you in control of what you’re doing? Are you the CEO of your own life? Are you going along for the ride? I often talk about school today as where we go from our kids are curious and they’re creative when they first start school, and in school they’re taught conformity, then all of a sudden, we’re into our careers and we get comfortable. That comfortable, this goes along with your pivot. As we’re comfortable, all of a sudden we face a crisis in our lives, whether it be personal, financial or professionally. We get thrown into chaos. We get out of that chaos when we’re in that pivot time by going back to curiosity and creativity. Keep creativity and curiosity alive in your children. In fact, Randi often asks me this question. She says, “What’s the creative opportunity?” Anytime we hit one of those moments that you might call a crisis moment or a moment of confusion or we’re caught unaware by something, what’s the creative opportunity there? That is looking at it very much through a child’s eyes. Sharon, what is drifting? How would you define that? If you have not read Outwitting the Devil, this is one of those great books to get for yourself and then gift to other people. Between the principle of drifting and what I was able to apply learning about masterminds in a different way, Think and Grow Rich introduced mastermind to me. When I read Outwitting the Devil, I got it at a deeper level. Let’s start with drifting. What is that? Creative Opportunities: A drifter just goes through life and lets life happen to them. I compare it to going with the flow, the term ‘whatever’. A drifter goes through life and lets life happen to them. They basically are not in control of their own destiny. They’re letting other people make decisions for them. They’re being complacent. If you’re a non-drifter, you are in charge of your own mind and you are in charge of what you’re doing. You have goals and you’re focused on achieving those goals. Will you get off course? Yes. Use the analogy of a sailor. If you’re in a sailboat, you’re not necessarily going to go straight from one point to the other. You’re going to go tick and tack, back and forth. You want to understand what your goal is and you’re always going to be focused there. You may get off the course a little bit but you know how to recalibrate because you know what your ultimate goal is. That’s the non-drifter, someone that’s in charge of their own mind and not allowing outside influences to pull them aside. Today, we have so much chaos and so much noise around us and so much negativity that sometimes permeates into our subconscious without us even realizing it. To get away from that drifting, focus on what is the environment around you? What are you allowing to be in your space? Who are you hanging out with? How are you spending your time? Those are all elements that we talk about in Outwitting the Devil, as to how you can take control of everything in your environment and the people you hang out with. That’s how you’re spending your time to create what your ultimate goal in life is. As Yogananda said, “Environment is stronger than will.” Do you believe that to be the case? Yes and no. There are people out there that have exceptionally strong wills and allow themselves to go in bad environments to create change. I would disagree with that statement in the fact that when you have such a strong will, you have the ability to go and pivot in an environment that is negative into one that’s positive. Can we dive into a bit of your pivot story? That’s one of the things that our community loves so much, the authenticity and even the vulnerability of our guests because we’ve all made mistakes. I’m not tired of talking about my mistakes. I don’t even know if we’re calling these mistakes anymore. Our lives are such a great reflection of the way that we’ve been able to alchemize change. Take something that you might call crap or that is framed and seen as something negative and utilize it for something amazing and beautiful and even change the trajectory of your life. I love the word that you used, recalibration. It’s a recalibration tool, this concept of pivoting. At my age, I’ve had a whole lot of pivots, Adam, but I’ll focus on just three of them. Like you, I started off as a professional and was highly successful in my career with a large accounting firm. At the ripe old age of 25 when we know everything, I said, “I’m working crazy hours. If I’m going to be working this hard, I should be working for myself instead of someone else.” One of my clients invited me to leave and go into a company with them that he was going to invest a lot of money in. It was the worst business decision of my life back in 1979. As Hill says, “Out of every adversity or failure comes a seed of an equal or greater benefit.,” Had I not made that decision to leave public accounting at that time, I would never have met Michael Lechter. We celebrated 37 years of marriage. Out of the worst business decision, which is still one of the worst business decisions I’ve made, I had the greatest life decision. Not always do we get such immediate feedback on what the positive outcome is but that certainly was a huge pivot in my life. Fast forward many years, this is when we started Rich Dad after a ten-year partnership. When I made that decision to leave, that was a huge decision. I was walking away from at the top of our tremendously successful company. It was no longer congruent with my own personal mission. Robert wanted to go into franchising. It was not a great model for us, not a good model for the franchisees. I had to make the decision to do what was right for me and that was a huge pivot. At the time, I was walking away from my legacy. I thought Rich Dad was my legacy. Somebody above said, “There’s more for you to do.” That’s when I got the call from President Bush asking to be on the President’s Advisory Council and the call from Don Green asking me to step into the world of Napoleon Hill. I often say, “Sometimes you have to close one door for other doors of opportunity to open.” That was a huge pivot in my life and I realized, “I have so much more to do in my life.” I’ve had an incredible opportunity. I’m working parallel with the Napoleon Hill Foundation. It’s been such a huge gift to have built the largest personal finance brand and then to be invited into the largest personal development brand and be able to breathe life into that for modern-day reader has just been an incredible experience. Five years ago, I had the biggest pivot of all and it really redefined everything in life to me, and that is the strength of family and friends. We lost our youngest son five years ago. I went dark for several years because I was still writing and still doing the things I needed to do, but it wasn’t playing big anymore. I needed time to heal. I don’t wish that experience on anyone. When you have that tremendous personal loss, whether it be financial, professional or someone close to you, it does redefine the importance of life and the importance of everyday being a gift. From a standpoint of sharing with your audience, there are lots of pivots in our lives. The issue is how we choose to respond to them and how we choose to move past them. Did you have a process that you either chose to use or just something that came as a result of that tragedy that you learned not only about your own resilience as a person you learned something about? There are no mistakes, there are just learning opportunities. I was releasing a book called Save Wisely, Spend Happily. Literally two weeks after I lost my son, I was supposed to be in New York and having a book launch. I was able to put on this shield of emotional armor and fly to New York. All I did was go into the studio to do what I needed to do to launch the book. It was mind over matter of doing what I knew I had agreed to do and to complete my willingness to do something for my profession and allow myself to set my emotions aside. That was also detrimental to me physically and emotionally because I was delaying grieving. Each one of us deals with that tragedy or emotional upset differently. We have to be willing to allow ourselves to go through the process whatever that process is. I have dear friends who’ve lost children and they’ve been much quicker to respond and to rebuild, but it doesn’t mean their grief wasn’t as deep. Each and every one of us, we have to look for friends and family to support us. I was so blessed. I’m grateful every day to the people that came and surrounded us with love and support. I wouldn’t have survived it had I not had that. As a time for reflection as to say we can’t understand why certain things happen but we have to say, “What’s next? How are we going to respond to it?” I know my son wouldn’t want me to hide away forever. I had to say, “How can I get past this?” I’ve started sharing that when I’m speaking because I didn’t feel comfortable sharing it. Now it’s really part of why I continue to drive myself, is that I’m still here. I need to feel like I’m making a contribution. We’re all grieving in different things at different times. The loss of a child, I can’t even, as a father of four, fathom it. I can’t fathom anything that would be more of a loss to a person than to lose their son or daughter. Yet people walk around with that grief, with that cloud of regret about their past, about a business that they’ve lost or a partnership that went sour or some other relationship perhaps. Grief is something that’s definitely with a lot of people a lot of the time, Sharon. It sounds like you got into action quickly as a way to distract yourself from dealing with that. The action was able to put your emotions aside for a period of time. It enabled you to do what you had to do and fulfill your responsibilities. At the same time, there was also a detriment. There was a price that you paid physically and emotionally as well. Do you have any advice for folks about grieving the loss of something other than human life? There are a lot of people that are stuck in the past. I’ve been in business for a lot of years. You’ve been in business for many years. Some of those businesses worked out great. Some of them worked out great for a time and then they didn’t work out great. Some of them crashed and burned. Entrepreneurs, especially successful entrepreneurs, have to have a skill, a tool, a gene or something that enables them to keep moving ahead, keep moving forward. It sounds like you’ve had that. Did you learn it? Was it part of your DNA? What can you share with our folks about that? The one thing we know about the world, there’s no such thing as a straight line and there are no straight lines in business. However we define success, it’s certainly not a straight line. One of my personal mantras is the question “Why not?” That’s very much in the hearts of all entrepreneurs. You say why to find out the question to why is your passion. In the world, the question why is you’re waiting for someone else to give you an answer. I always say, “Why not? Why not take the road less traveled? Why not do something that someone else is not doing?” That ‘”Why not?” is coming from within. That’s been a personal mantra. The issue of understanding when something doesn’t work out, you say “What’s next?” because there were circumstances at play. I deal a lot with people who’ve lost their businesses or they’re finding tremendous financial distress. A lot of people refuse to change what they’re doing. In order for you to create a better life or to get out of debt or to start a new business, you need to be able to sit back and try and set the emotions aside, “What can I do differently in the future to get different results?” So many people end up doing the same thing over and over again. We’ve all heard the definition of insanity is doing the same thing over and over again and expecting different results. Truly in real life, I see women that pick the same kind of men over and over again or people who start a business and they have a track record of failures because they think they know what they need to do. You need to be open to learning the mistakes. There are no mistakes, there are just learning opportunities. “That didn’t work. What else can we do? What’s next?” It doesn’t mean that you don’t have that feeling. There’s also a big difference between men and women. I talked about it in Think and Grow Rich for Women between men and women. Men don’t let mistakes define who they are. They’re, “Next, let’s keep going.” Women tend to do that. We carry our mistakes is like a big sack of potatoes on our shoulders. It’s something that I deal with all the time with women. It doesn’t define who you are. When you make a mistake or you have a failure, say, “What was the lesson?” because that isn’t who you are. It’s just something that you experienced. Take that lesson, learn from it and go on and create the next chapter of your life, that pivot in your life. Sharon, I want to cover two things. One of them has to do with the financial advice you’ve given to so many people. Is there one pivotal piece of advice more than anything else you find for men or women that you’ve given that has been pivotal? My favorite word on Earth is the word “assets.” I like to try and make things as simple as possible. All wealthy people, no matter what language they speak or where they live, they’re wealthy because they have assets that generate revenue. We think about how much we’re earning, our income. Stop thinking about income. Start thinking about assets. It’s not what you do for your paycheck that counts, it’s what you do with your paycheck that counts. One of the things I’m talking to people about right now with the Tax Reform Act, a time when people were getting bonuses or salary increases, allow that money to go into an investment account where you can start buying assets, whether it be rental real estate or the stock market or a matching 401(k). Allow that because you haven’t seen that money. You’ve been living without that money. Use that money as a jumpstart to your investment account. Financial freedom is when income from your assets exceed your expenses. Assets is the one commonality no matter what kind of wealth you have that separates people who are financially free from those who are not. Creative Opportunities: Out of every adversity or failure comes a seed of an equal or greater benefit. The thing that we are driven by is our habits. Clearly, we have habits, these unconscious ways of being and thinking and all that. Then there is this opportunity to change. People are a product of their habits and even victims of their habits sometimes. If we want to create a new result, we’ve got to do things differently. To change those habits, we’ve got to override them. We have a word that we use for that. We call it rituals, more of a conscious master habit. What rituals do you have? What habits do you do and things that you do consciously in order to either get yourself in a more clear headspace or to be closer to your Maker or to be more attuned with what your heart is guiding you to do? What are some of the rituals that you use on a daily basis? I have several but one before this interview, before any time I get on stage, before I do anything, I say the Prayer of Jabez which basically is saying to the greater power, “Use me and let me say what needs to be said and what can help the audience.” It goes, “Enlarge my territory and let your hand be with me so that I’m saying what I’m supposed to be saying. Protect me if there are people that don’t like what I’m saying.” I highly recommend the Prayer of Jabez as something that has helped me for many years. When my son passed away, that became my shining lifeline. Then also from a more practical sense, I’m a huge user of time blocks because we have so many shiny object syndromes particularly with Twitter and Facebook and email popping in all the time, set aside time to accomplish missions and accomplish tasks. It’s not something I did until the last couple of years. It’s been very helpful. I have something many years ago, I called it my 222 Rule which was I would send two personal notes, make two phone calls and two faxes for the future of my business before I would end the day, so constantly always focusing on the future. Today, we don’t send too many faxes anymore but it’s social media posts, emails, personal phone calls and personal notes. It’s a 2222 rule but I try and do that every day, always looking to the future, always being creative and focusing on how to continue serving people into the future. The Prayer of Jabez, is that something that you’ve read or do you have it committed to memory? I remember when I read Think and Grow Rich for the first time, I adopted this mantra. “I ask not, O Divine Providence, for more riches but more wisdom with which to accept and use wisely the riches I received at birth in the form of power to control and direct my mind to whatever ends I desire.” It’s always great to be with someone else and to hear what their mantras are, the things that they say, the prayers they repeat. It’s so often the case that we keep a lot of these things to ourselves, not because we’re trying to hoard them but because I don’t know that we’re always so comfortable in sharing with the world how big a part these sayings play in our lives, the prayers that we say, the prayers upon waking or before going to bed, the ways that we humble ourselves on a daily basis, regardless of whatever your CV looks like, whatever your accomplishments are. We’re all human beings. We all put our pants on one leg at a time and have made mistakes, had great successes, had great joys and great sorrows. You say why to find out the question to why is your passion. Sharon, your presence is liberating. It’s beautiful. You’ve done so much to liberate people from the mindset of the dis-empowered employee. I remember when I was reading Rich Dad Poor Dad in the late ’90s. I was an attorney and I was a workaholic and I thought I had it all going on. I had a lot of money and a very successful business. I was so trading my time for money and missing the lives of our kids, missing so much along the way. I wasn’t building assets, I was just building income and spending it as quickly as it came in. That book opened my eyes. To know how much that book has changed so many lives and the influence that you’ve had in putting that information out into the world is just a blessing. Thank you for being on the show. I know you’re doing some great things now. Where can people find you? What’s the best way for men and women who wish to know about the work of the Napoleon Hill Foundation or your personal work? Where is the best way for people to find you? Visit me at SharonLechter.com. Everything is there. If you go to SharonLechter.com/Gift, I have a book called You and Your Money. It’s a 200-page book on all things money. That is my gift to everyone. Thank you, Sharon. Any final words? Anything you’d like to say before we close up? Adam, I want to thank you so much for including me. I applaud you for what you’re doing. You are a true gift to all who work with you and all who know you. It’s my honor and pleasure to know you and to applaud you as well. For everyone, I want to congratulate you for taking the time to learn from Adam. Certainly, I’m honored that you’re listening to me as well. Realize what action you are going to take. We can do a lot of listening, we can do a lot of reading, but I challenge you, what did you hear that made you say, ” I can do that?” Please make us know that we’ve made an impact on your life by taking action in your personal life. Thank you, Sharon. For everybody out there, we love it that you’re listening and that you are a part of our community. If you haven’t yet subscribed to the podcast, do that. If you have not yet joined our Start My PIVOT Community on Facebook, please look to that community for support and resources. People are sharing incredible things in that arena. It’s a vulnerable space but it’s a sacred space. The support that’s given and the opportunities to receive support is profound. You can get there by going to PivotFB.com. As we close out the session the way we always do, bookending our thoughts at the beginning, I’m going to wave my magic wand and everybody who’s listening, you get to wake up tomorrow. That’s my prayer. That’s my hope. I’m grateful for that. We all get to wake up and as you do, as you take that first breath in the morning, regardless of what may be happening in the world around you or in your personal world, recognize how important that breath is, how beautiful that breath is and it is something to be grateful for. The three-part ritual for programming and in some ways re-programming your subconscious as well as your conscious to be present and to be loving of yourself is simply to wake up, to be grateful and to put your feet on the floor. If you’re able to do that, what a blessing that is as well. Say these words, “I love my life. I love my life. I love my life.” We’ll see you very soon. Ciao for now. Wonderful interview. Lots of wisdom from Sharon and Adam. Thank you, Kimchi. So glad you enjoyed it! Looking forward to seeing you very soon.